I received a letter that was partially written in the ever-popular Stormy Grey. 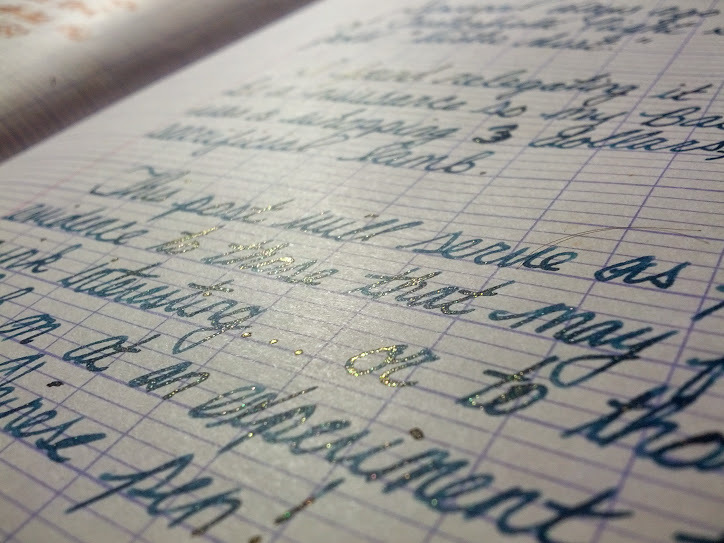 I loved the gold sheen it had, but it is out of stock and my favorite color just so happens to be blue anyway. 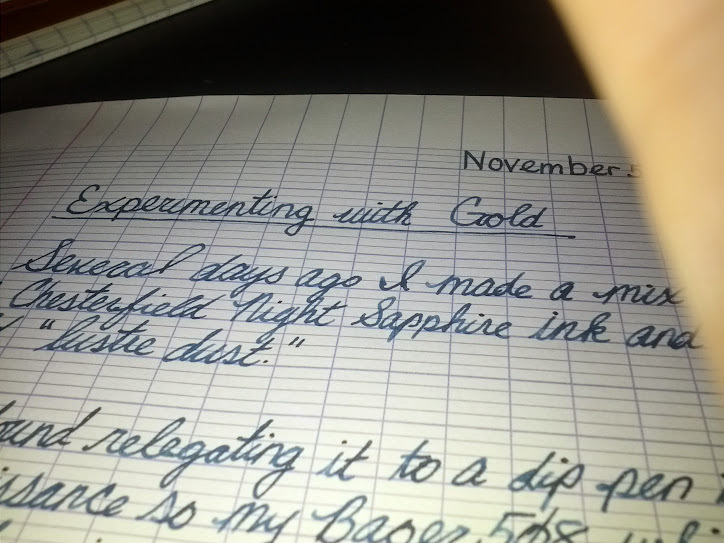 Here's what I came up with after adding "dashes," "pinches," and "smidgens" of gold powder until satisfied. I think that I may have gone a bit heavy on the powder, but pictures do not truly represent the look of ink on paper, as I'm sure most of us already know. 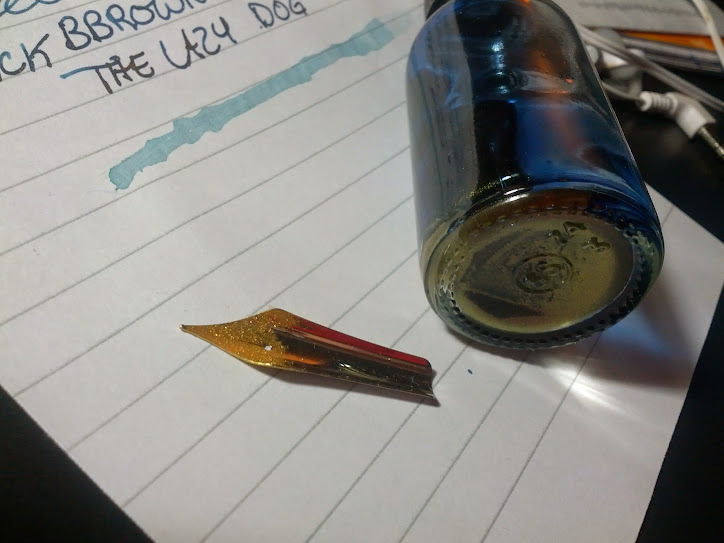 Looking straight on, the ink looks like an average ink. Only when it is tilted slightly towards a source of light does it begin to show all its glory. 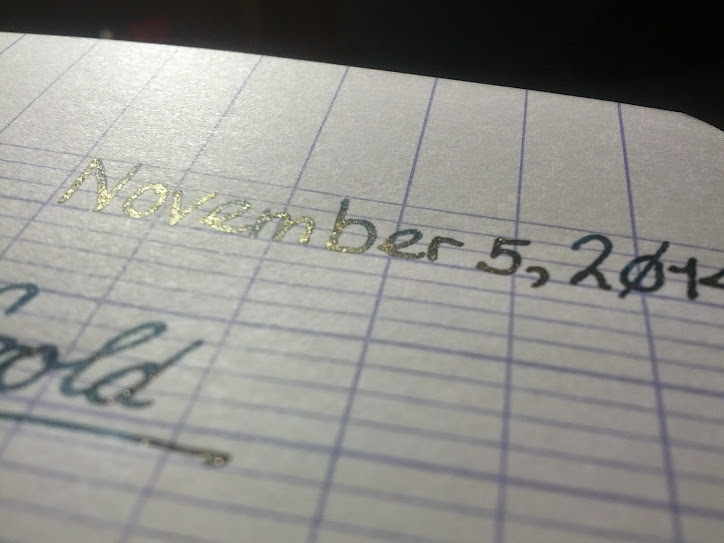 Here's a failed picture showing sheen - this is what the ink looks like without the sheen. So far, I really have not had any issues. The pen was skippy and very dry when playing with the ink earlier today. 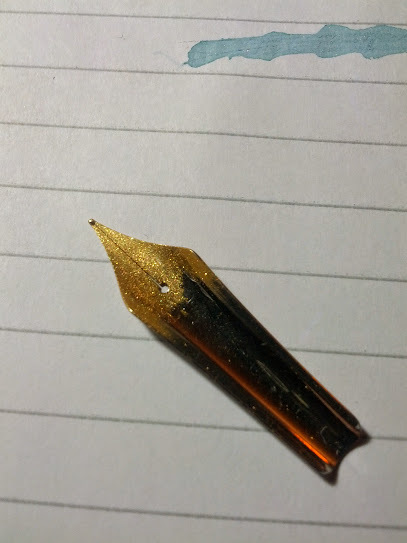 I pulled the nib and feed to inspect them with a loupe, but could see no clogs. I flossed the nib and re-assembled everything, which seemed to solve the problem. The C/C was very low on ink, though, so I will have to play around with it some more to figure out whether or not it was truly clogged or just running on "fumes." Love it, hate it, or something in between - let me know what you think. I personally think it's a cool idea, and it certainly looks good from the photos. Interesting. Where did you get the powder, and is it real gold (i.e., 10 or 14K, or something as high as 24K?). I don't know what it is - at this price it is certainly not real gold. It seemed to be the smallest particles pictured on the cheap. 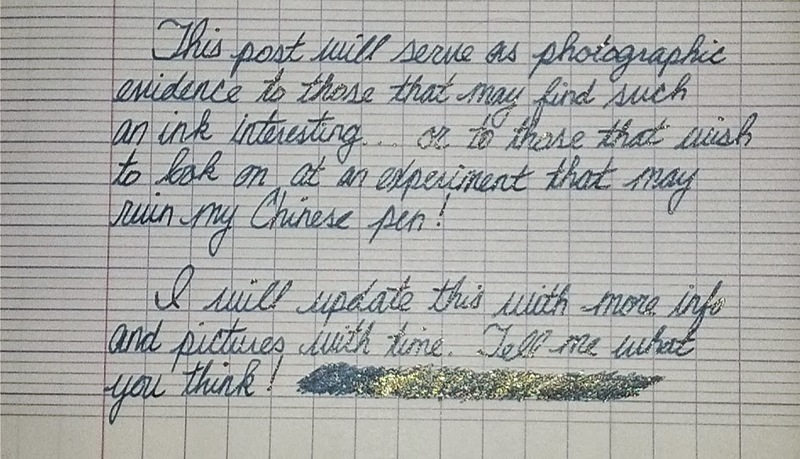 So far it is worked pretty well and by eyeball looks to be about the same particle size as used in J. Herbin Stormy Grey. I also picked up some gum arabic, but have not felt the need to add any as it stays on the paper when rubbed. The only time I've seen any smearing is with a dried ink drop, which had a big pile of the powder. *Edit: A list of 25 different colors (several colors of gold) were included with the package. 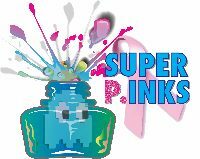 It might be interesting to use different powders for different ink colors. Edited by TheRealScubaSteve, 07 November 2014 - 02:22. Here's a shot of a finger swab from a (mostly) clean syringe. To the right you can see very fine particles - that's the powder size. I've heavily adjusted the contrast/saturation/brightness in the photo so that it can be better seen. Here's my a photo of powder on my "measuring device." The gold powder very quickly settles, both in the bottle and in the pen. I give it a few careful shakes in the pen to stir it up when writing with it for more than a couple lines or after it has sat unused for more than a few minutes. A ball or spring in the C/C helps, but would not be completely necessary because ink provides enough lubrication that the powder will fall to the bottom without much liquid at all. Ohhh. Luster Dust? I've used that in cake decorating and making edible sugar sculptures. Particularly like the Silver and the Aztec (?) 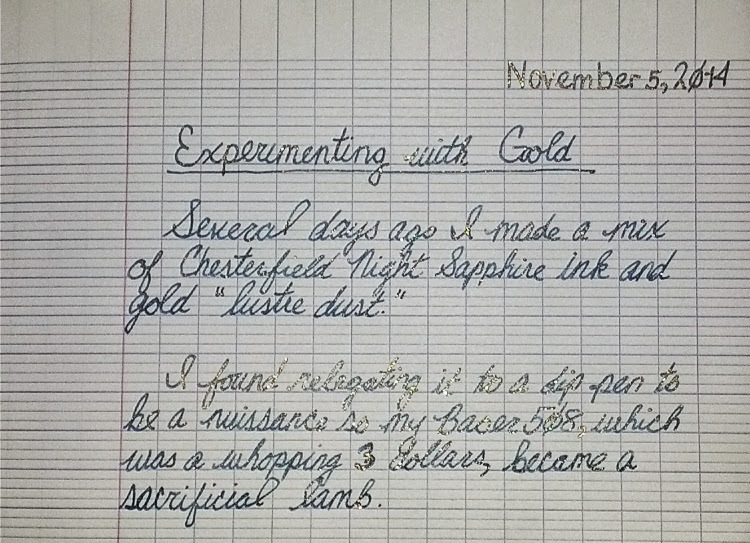 Gold but have also used the Peacock Blue. Not sure I would have put that into a pen, myself.... I've always used it with liquid and then painted it on the surface with a small craft brush or watercolor brush dedicated to using with food stuff. Oh, and if you're buying it, get the CK brand stuff if you can find it -- I hate the stuff Wilton's makes, because it does *not* behave the same when mixed with clear alcohol or rosewater to paint onto sugarplate or gum paste. Edited by inkstainedruth, 07 November 2014 - 03:43. Why would you not have put it into a pen - what is it, anyway? My only concern was that it was sugar and I'd find Night Sapphire Karos syrup in the feed. It does say non-toxic, but I'm not sure I'd want to eat it. Then again, I don't see the appeal of edible gold, either. Look at stores that sell cake decorating supplies. That's where i've found it. Edited by vossad01, 08 November 2014 - 06:18. Perhaps later this week I'll store the pen nib down and see what happens. It tends to dry out easily so it should be a good test to see whether a flushing can clear the feed. Edited by TheRealScubaSteve, 08 November 2014 - 06:23. I suspect this stuff: http://www.joann.com...b_desc=11449873 would also work - I do know people will suspend it in water and use it with spray bottles long-term without problem. I'll see what I can find locally. Thanks for the explanations! Okay, I have a whole slew of powdered pigments I got for nail polish back in the day - I wonder if some of them would work with ink? 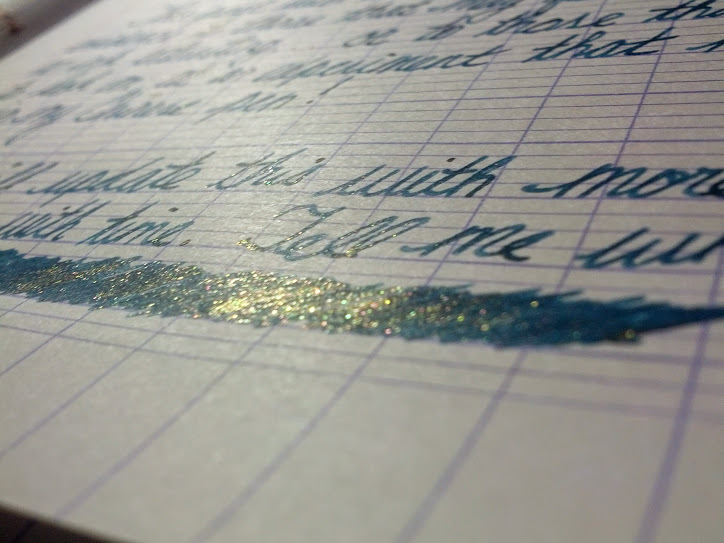 I have a little tiny thing of Spectraflair holographic powder, and now I really want to try it out with some Noodler's Black. The pictures of it makes it look pretty thin to me. I'd go for it, just be sure to use a dip pen or be ready to gunk up an inexpensive pen! You could try some nail polish and some mica in a Noodler's brush pen . . . OK, maybe that's not a good idea. Whatever you try - remember, easy to clean and inexpensive pen.